This article is about current oscilloscopes, providing general information. For history of oscilloscopes, see Oscilloscope history. For detailed information about various types of oscilloscopes, see Oscilloscope types. For the film distributor, see Oscilloscope Laboratories. An oscilloscope, previously called an oscillograph, and informally known as a scope or o-scope, CRO (for cathode-ray oscilloscope), or DSO (for the more modern digital storage oscilloscope), is a type of electronic test instrument that graphically displays varying signal voltages, usually as a two-dimensional plot of one or more signals as a function of time. Other signals (such as sound or vibration) can be converted to voltages and displayed. Oscilloscopes display the change of an electrical signal over time, with voltage and time as the Y- and X-axes, respectively, on a calibrated scale. The waveform can then be analyzed for properties such as amplitude, frequency, rise time, time interval, distortion, and others. Modern digital instruments may calculate and display these properties directly. Originally, calculation of these values required manually measuring the waveform against the scales built into the screen of the instrument. The oscilloscope can be adjusted so that repetitive signals can be observed as a continuous shape on the screen. A storage oscilloscope can capture a single event and display it continuously, so the user can observe events that would otherwise appear too briefly to see directly. Oscilloscopes are used in the sciences, medicine, engineering, automotive and the telecommunications industry. General-purpose instruments are used for maintenance of electronic equipment and laboratory work. Special-purpose oscilloscopes may be used for such purposes as analyzing an automotive ignition system or to display the waveform of the heartbeat as an electrocardiogram. Early oscilloscopes used cathode ray tubes (CRTs) as their display element (hence they were commonly referred to as CROs) and linear amplifiers for signal processing. Storage oscilloscopes used special storage CRTs to maintain a steady display of a single brief signal. CROs were later largely superseded by digital storage oscilloscopes (DSOs) with thin panel displays, fast analog-to-digital converters and digital signal processors. DSOs without integrated displays (sometimes known as digitisers) are available at lower cost and use a general-purpose digital computer to process and display waveforms. The basic oscilloscope, as shown in the illustration, is typically divided into four sections: the display, vertical controls, horizontal controls and trigger controls. The display is usually a CRT (historically) or LCD panel laid out with horizontal and vertical reference lines called the graticule. CRT displays also have controls for focus, intensity, and beam finder. The vertical section controls the amplitude of the displayed signal. This section has a volts-per-division (Volts/Div) selector knob, an AC/DC/Ground selector switch, and the vertical (primary) input for the instrument. Additionally, this section is typically equipped with the vertical beam position knob. The horizontal section controls the time base or "sweep" of the instrument. The primary control is the Seconds-per-Division (Sec/Div) selector switch. Also included is a horizontal input for plotting dual X-Y axis signals. The horizontal beam position knob is generally located in this section. The trigger section controls the start event of the sweep. The trigger can be set to automatically restart after each sweep, or can be configured to respond to an internal or external event. The principal controls of this section are the source and coupling selector switches, and an external trigger input (EXT Input) and level adjustment. In addition to the basic instrument, most oscilloscopes are supplied with a probe as shown. The probe connects to any input on the instrument and typically has a resistor of ten times the oscilloscope's input impedance. This results in a .1 (‑10X) attenuation factor; this helps to isolate the capacitive load presented by the probe cable from the signal being measured. Some probes have a switch allowing the operator to bypass the resistor when appropriate. Most modern oscilloscopes are lightweight, portable instruments compact enough for a single person to carry. In addition to portable units, the market offers a number of miniature battery-powered instruments for field service applications. Laboratory grade oscilloscopes, especially older units that use vacuum tubes, are generally bench-top devices or are mounted on dedicated carts. Special-purpose oscilloscopes may be rack-mounted or permanently mounted into a custom instrument housing. The signal to measure is fed to one of the input connectors, which is usually a coaxial connector such as a BNC or UHF type. Binding posts or banana plugs may be used for lower frequencies. If the signal source has its own coaxial connector, then a simple coaxial cable is used; otherwise, a specialized cable called a "scope probe", supplied with the oscilloscope, is used. In general, for routine use, an open wire test lead for connecting to the point being observed is not satisfactory, and a probe is generally necessary. General-purpose oscilloscopes usually present an input impedance of 1 megohm in parallel with a small but known capacitance such as 20 picofarads. This allows the use of standard oscilloscope probes. Scopes for use with very high frequencies may have 50‑ohm inputs. These must be either connected directly to a 50‑ohm signal source or used with Z0 or active probes. Less-frequently-used inputs include one (or two) for triggering the sweep, horizontal deflection for X‑Y mode displays, and trace brightening/darkening, sometimes called z'‑axis inputs. Open wire test leads (flying leads) are likely to pick up interference, so they are not suitable for low level signals. Furthermore, the leads have a high inductance, so they are not suitable for high frequencies. Using a shielded cable (i.e., coaxial cable) is better for low level signals. Coaxial cable also has lower inductance, but it has higher capacitance: a typical 50 ohm cable has about 90 pF per meter. Consequently, a one-meter direct (1X) coaxial probe loads a circuit with a capacitance of about 110 pF and a resistance of 1 megohm. To minimize loading, attenuator probes (e.g., 10X probes) are used. A typical probe uses a 9 megohm series resistor shunted by a low-value capacitor to make an RC compensated divider with the cable capacitance and scope input. The RC time constants are adjusted to match. For example, the 9 megohm series resistor is shunted by a 12.2 pF capacitor for a time constant of 110 microseconds. The cable capacitance of 90 pF in parallel with the scope input of 20 pF and 1 megohm (total capacitance 110 pF) also gives a time constant of 110 microseconds. In practice, there is an adjustment so the operator can precisely match the low frequency time constant (called compensating the probe). Matching the time constants makes the attenuation independent of frequency. At low frequencies (where the resistance of R is much less than the reactance of C), the circuit looks like a resistive divider; at high frequencies (resistance much greater than reactance), the circuit looks like a capacitive divider. The result is a frequency compensated probe for modest frequencies. It presents a load of about 10 megohms shunted by 12 pF. Such a probe is an improvement, but does not work well when the time scale shrinks to several cable transit times or less (transit time is typically 5 ns). [clarification needed] In that time frame, the cable looks like its characteristic impedance, and reflections from the transmission line mismatch at the scope input and the probe causes ringing. The modern scope probe uses lossy low capacitance transmission lines and sophisticated frequency shaping networks to make the 10X probe perform well at several hundred megahertz. Consequently, there are other adjustments for completing the compensation. Probes with 10:1 attenuation are by far the most common; for large signals (and slightly-less capacitive loading), 100:1 probes may be used. There are also probes that contain switches to select 10:1 or direct (1:1) ratios, but the latter setting has significant capacitance (tens of pF) at the probe tip, because the whole cable's capacitance is then directly connected. Most oscilloscopes provide for probe attenuation factors, displaying the effective sensitivity at the probe tip. Historically, some auto-sensing circuitry used indicator lamps behind translucent windows in the panel to illuminate different parts of the sensitivity scale. To do so, the probe connectors (modified BNCs) had an extra contact to define the probe's attenuation. (A certain value of resistor, connected to ground, "encodes" the attenuation.) Because probes wear out, and because the auto-sensing circuitry is not compatible between different oscilloscope makes, auto-sensing probe scaling is not foolproof. Likewise, manually setting the probe attenuation is prone to user error. Setting the probe scaling incorrectly is a common error, and throws the reading off by a factor of 10. There are also current probes, with cores that surround the conductor carrying current to be examined. One type has a hole for the conductor, and requires that the wire be passed through the hole for semi-permanent or permanent mounting. However, other types, used for temporary testing, have a two-part core that can be clamped around a wire. Inside the probe, a coil wound around the core provides a current into an appropriate load, and the voltage across that load is proportional to current. This type of probe only senses AC. A more-sophisticated probe includes a magnetic flux sensor (Hall effect sensor) in the magnetic circuit. The probe connects to an amplifier, which feeds (low frequency) current into the coil to cancel the sensed field; the magnitude of the current provides the low-frequency part of the current waveform, right down to DC. The coil still picks up high frequencies. There is a combining network akin to a loudspeaker crossover network. This control adjusts CRT focus to obtain the sharpest, most-detailed trace. In practice, focus must be adjusted slightly when observing very different signals, so it must be an external control. The control varies the voltage applied to a focusing anode within the CRT. Flat-panel displays do not need this control. This adjusts trace brightness. Slow traces on CRT oscilloscopes need less, and fast ones, especially if not often repeated, require more brightness. On flat panels, however, trace brightness is essentially independent of sweep speed, because the internal signal processing effectively synthesizes the display from the digitized data, or from the kitty picture. This control may instead be called "shape" or "spot shape". It adjusts the relative voltages on two of the CRT anodes, changing a displayed spot from elliptical in one plane through a circular spot to an ellipse at 90 degrees to the first. This control may be absent from simpler oscilloscope designs or may even be an internal control. It is not necessary with flat panel displays. Modern oscilloscopes have direct-coupled deflection amplifiers, which means the trace could be deflected off-screen. They also might have their beam blanked without the operator knowing it. To help in restoring a visible display, the beam finder circuit overrides any blanking and limits the beam deflected to the visible portion of the screen. Beam-finder circuits often distort the trace while activated. The graticule is a grid of lines that serve as reference marks for measuring the displayed trace. These markings, whether located directly on the screen or on a removable plastic filter, usually consist of a 1 cm grid with closer tick marks (often at 2 mm) on the centre vertical and horizontal axis. One expects to see ten major divisions across the screen; the number of vertical major divisions varies. Comparing the grid markings with the waveform permits one to measure both voltage (vertical axis) and time (horizontal axis). Frequency can also be determined by measuring the waveform period and calculating its reciprocal. On old and lower-cost CRT oscilloscopes the graticule is a sheet of plastic, often with light-diffusing markings and concealed lamps at the edge of the graticule. The lamps had a brightness control. Higher-cost instruments have the graticule marked on the inside face of the CRT, to eliminate parallax errors; better ones also had adjustable edge illumination with diffusing markings. (Diffusing markings appear bright.) Digital oscilloscopes, however, generate the graticule markings on the display in the same way as the trace. External graticules also protect the glass face of the CRT from accidental impact. Some CRT oscilloscopes with internal graticules have an unmarked tinted sheet plastic light filter to enhance trace contrast; this also serves to protect the faceplate of the CRT. Accuracy and resolution of measurements using a graticule is relatively limited; better instruments sometimes have movable bright markers on the trace. These permit internal circuits to make more refined measurements. Both calibrated vertical sensitivity and calibrated horizontal time are set in 1 - 2 - 5 - 10 steps. This leads, however, to some awkward interpretations of minor divisions. Digital oscilloscopes generate the graticule digitally. The scale, spacing, etc., of the graticule can therefore be varied, and accuracy of readings may be improved. Computer Model of the impact of increasing the timebase time/division. These select the horizontal speed of the CRT's spot as it creates the trace; this process is commonly referred to as the sweep. In all but the least-costly modern oscilloscopes, the sweep speed is selectable and calibrated in units of time per major graticule division. Quite a wide range of sweep speeds is generally provided, from seconds to as fast as picoseconds (in the fastest) per division. Usually, a continuously-variable control (often a knob in front of the calibrated selector knob) offers uncalibrated speeds, typically slower than calibrated. This control provides a range somewhat greater than the calibrated steps, making any speed between the steps available. Some higher-end analog oscilloscopes have a holdoff control. This sets a time after a trigger during which the sweep circuit cannot be triggered again. It helps provide a stable display of a repetitive events in which some triggers would create confusing displays. It is usually set to minimum, because a longer time decreases the number of sweeps per second, resulting in a dimmer trace. See Holdoff for a more detailed description. To accommodate a wide range of input amplitudes, a switch selects calibrated sensitivity of the vertical deflection. Another control, often in front of the calibrated-selector knob, offers a continuously-variable sensitivity over a limited range from calibrated to less-sensitive settings. Often the observed signal is offset by a steady component, and only the changes are of interest. An input coupling switch in the "AC" position connects a capacitor in series with the input. This passes only the changes (provided they are not too slow ("slow" would mean visible). However, when the signal has a fixed offset of interest, or changes quite slowly, the user will usually prefer "DC" coupling, which bypasses any such capacitor. Most oscilloscopes offer the DC input option. For convenience, to see where zero volts input currently shows on the screen, many oscilloscopes have a third switch position (usually labeled "GND" for ground) that disconnects the input and grounds it. Often, in this case, the user centers the trace with the vertical position control. Better oscilloscopes have a polarity selector. Normally, a positive input moves the trace upward; the polarity selector offers an "inverting" option, in which a positive-going signal deflects the trace downward. This control is found only on more elaborate oscilloscopes; it offers adjustable sensitivity for external horizontal inputs. It is only active when the instrument is in X-Y mode, i.e. the internal horizontal sweep is turned off. The vertical position control moves the whole displayed trace up and down. It is used to set the no-input trace exactly on the center line of the graticule, but also permits offsetting vertically by a limited amount. With direct coupling, adjustment of this control can compensate for a limited DC component of an input. The horizontal position control moves the display sidewise. It usually sets the left end of the trace at the left edge of the graticule, but it can displace the whole trace when desired. This control also moves the X-Y mode traces sidewise in some instruments, and can compensate for a limited DC component as for vertical position. Each input channel usually has its own set of sensitivity, coupling, and position controls, though some four-trace oscilloscopes have only minimal controls for their third and fourth channels. Dual-trace oscilloscopes have a mode switch to select either channel alone, both channels, or (in some) an X‑Y display, which uses the second channel for X deflection. When both channels are displayed, the type of channel switching can be selected on some oscilloscopes; on others, the type depends upon timebase setting. If manually selectable, channel switching can be free-running (asynchronous), or between consecutive sweeps. Some Philips dual-trace analog oscilloscopes had a fast analog multiplier, and provided a display of the product of the input channels. Multiple-trace oscilloscopes have a switch for each channel to enable or disable display of the channel's trace. These include controls for the delayed-sweep timebase, which is calibrated, and often also variable. The slowest speed is several steps faster than the slowest main sweep speed, though the fastest is generally the same. A calibrated multiturn delay time control offers wide range, high resolution delay settings; it spans the full duration of the main sweep, and its reading corresponds to graticule divisions (but with much finer precision). Its accuracy is also superior to that of the display. A switch selects display modes: Main sweep only, with a brightened region showing when the delayed sweep is advancing, delayed sweep only, or (on some) a combination mode. Good CRT oscilloscopes include a delayed-sweep intensity control, to allow for the dimmer trace of a much-faster delayed sweep which nevertheless occurs only once per main sweep. Such oscilloscopes also are likely to have a trace separation control for multiplexed display of both the main and delayed sweeps together. A switch selects the trigger source. It can be an external input, one of the vertical channels of a dual or multiple-trace oscilloscope, or the AC line (mains) frequency. Another switch enables or disables auto trigger mode, or selects single sweep, if provided in the oscilloscope. Either a spring-return switch position or a pushbutton arms single sweeps. A trigger level control varies the voltage required to generate a trigger, and the slope switch selects positive-going or negative-going polarity at the selected trigger level. Type 465 Tektronix oscilloscope. This was a popular analog oscilloscope, portable, and is a representative example. To display events with unchanging or slowly (visibly) changing waveforms, but occurring at times that may not be evenly spaced, modern oscilloscopes have triggered sweeps. Compared to older, simpler oscilloscopes with continuously-running sweep oscillators, triggered-sweep oscilloscopes are markedly more versatile. A triggered sweep starts at a selected point on the signal, providing a stable display. In this way, triggering allows the display of periodic signals such as sine waves and square waves, as well as nonperiodic signals such as single pulses, or pulses that do not recur at a fixed rate. With triggered sweeps, the scope blanks the beam and starts to reset the sweep circuit each time the beam reaches the extreme right side of the screen. For a period of time, called holdoff, (extendable by a front-panel control on some better oscilloscopes), the sweep circuit resets completely and ignores triggers. Once holdoff expires, the next trigger starts a sweep. The trigger event is usually the input waveform reaching some user-specified threshold voltage (trigger level) in the specified direction (going positive or going negative—trigger polarity). In some cases, variable holdoff time can be useful to make the sweep ignore interfering triggers that occur before the events to be observed. In the case of repetitive, but complex waveforms, variable holdoff can provide a stable display that could not otherwise be achieved. Trigger holdoff defines a certain period following a trigger during which the sweep cannot be triggered again. This makes it easier to establish a stable view of a waveform with multiple edges, which would otherwise cause additional triggers. On an actual scope, each trigger would be the same channel, so all would be the same color. It desirable for the scope to only trigger on one edge per cycle, so it is necessary to set the holdoff at slightly less than the period of the waveform. This prevents triggering from occurring more than once per cycle, but still lets it trigger on the first edge of the next cycle. Triggered sweeps can display a blank screen if there are no triggers. To avoid this, these sweeps include a timing circuit that generates free-running triggers so a trace is always visible. This is referred to as "auto sweep" or "automatic sweep" in the controls. Once triggers arrive, the timer stops providing pseudo-triggers. The user will usually disable automatic sweep when observing low repetition rates. If the input signal is periodic, the sweep repetition rate can be adjusted to display a few cycles of the waveform. Early (tube) oscilloscopes and lowest-cost oscilloscopes have sweep oscillators that run continuously, and are uncalibrated. Such oscilloscopes are very simple, comparatively inexpensive, and were useful in radio servicing and some TV servicing. Measuring voltage or time is possible, but only with extra equipment, and is quite inconvenient. They are primarily qualitative instruments. They have a few (widely spaced) frequency ranges, and relatively wide-range continuous frequency control within a given range. In use, the sweep frequency is set to slightly lower than some submultiple of the input frequency, to display typically at least two cycles of the input signal (so all details are visible). A very simple control feeds an adjustable amount of the vertical signal (or possibly, a related external signal) to the sweep oscillator. The signal triggers beam blanking and a sweep retrace sooner than it would occur free-running, and the display becomes stable. Some oscilloscopes offer these. The user manually arms the sweep circuit (typically by a pushbutton or equivalent). "Armed" means it's ready to respond to a trigger. Once the sweep completes, it resets, and does not sweep again until re-armed. This mode, combined with an oscilloscope camera, captures single-shot events. external trigger, a pulse from an external source connected to a dedicated input on the scope. video trigger, a circuit that extracts synchronizing pulses from video formats such as PAL and NTSC and triggers the timebase on every line, a specified line, every field, or every frame. This circuit is typically found in a waveform monitor device, though some better oscilloscopes include this function. delayed trigger, which waits a specified time after an edge trigger before starting the sweep. As described under delayed sweeps, a trigger delay circuit (typically the main sweep) extends this delay to a known and adjustable interval. In this way, the operator can examine a particular pulse in a long train of pulses. Some recent designs of oscilloscopes include more sophisticated triggering schemes; these are described toward the end of this article. More sophisticated analog oscilloscopes contain a second timebase for a delayed sweep. A delayed sweep provides a very detailed look at some small selected portion of the main timebase. The main timebase serves as a controllable delay, after which the delayed timebase starts. This can start when the delay expires, or can be triggered (only) after the delay expires. Ordinarily, the delayed timebase is set for a faster sweep, sometimes much faster, such as 1000:1. At extreme ratios, jitter in the delays on consecutive main sweeps degrades the display, but delayed-sweep triggers can overcome this. The display shows the vertical signal in one of several modes: the main timebase, or the delayed timebase only, or a combination thereof. When the delayed sweep is active, the main sweep trace brightens while the delayed sweep is advancing. In one combination mode, provided only on some oscilloscopes, the trace changes from the main sweep to the delayed sweep once the delayed sweep starts, though less of the delayed fast sweep is visible for longer delays. Another combination mode multiplexes (alternates) the main and delayed sweeps so that both appear at once; a trace separation control displaces them. DSOs can display waveforms this way, without offering a delayed timebase as such. Switching channels can be asynchronous, i.e. free-running, with respect to the sweep frequency; or it can be done after each horizontal sweep is complete. Asynchronous switching is usually designated "Chopped", while sweep-synchronized is designated "Alt[ernate]". A given channel is alternately connected and disconnected, leading to the term "chopped". Multi-trace oscilloscopes also switch channels either in chopped or alternate modes. In general, chopped mode is better for slower sweeps. It is possible for the internal chopping rate to be a multiple of the sweep repetition rate, creating blanks in the traces, but in practice this is rarely a problem. The gaps in one trace are overwritten by traces of the following sweep. A few oscilloscopes had a modulated chopping rate to avoid this occasional problem. Alternate mode, however, is better for faster sweeps. In an analog oscilloscope, the vertical amplifier acquires the signal[s] to be displayed and provides a signal large enough to deflect the CRT's beam. In better oscilloscopes, it delays the signal by a fraction of a microsecond. The maximum deflection is at least somewhat beyond the edges of the graticule, and more typically some distance off-screen. The amplifier has to have low distortion to display its input accurately (it must be linear), and it has to recover quickly from overloads. As well, its time-domain response has to represent transients accurately—minimal overshoot, rounding, and tilt of a flat pulse top. A vertical input goes to a frequency-compensated step attenuator to reduce large signals to prevent overload. The attenuator feeds one or more low-level stages, which in turn feed gain stages (and a delay-line driver if there is a delay). Subsequent gain stages lead to the final output stage, which develops a large signal swing (tens of volts, sometimes over 100 volts) for CRT electrostatic deflection. In dual and multiple-trace oscilloscopes, an internal electronic switch selects the relatively low-level output of one channel's early-stage amplifier and sends it to the following stages of the vertical amplifier. In free-running ("chopped") mode, the oscillator (which may be simply a different operating mode of the switch driver) blanks the beam before switching, and unblanks it only after the switching transients have settled. Part way through the amplifier is a feed to the sweep trigger circuits, for internal triggering from the signal. This feed would be from an individual channel's amplifier in a dual or multi-trace oscilloscope, the channel depending upon the setting of the trigger source selector. This feed precedes the delay (if there is one), which allows the sweep circuit to unblank the CRT and start the forward sweep, so the CRT can show the triggering event. High-quality analog delays add a modest cost to an oscilloscope, and are omitted in cost-sensitive oscilloscopes. The delay, itself, comes from a special cable with a pair of conductors wound around a flexible, magnetically soft core. The coiling provides distributed inductance, while a conductive layer close to the wires provides distributed capacitance. The combination is a wideband transmission line with considerable delay per unit length. Both ends of the delay cable require matched impedances to avoid reflections. A 24-hour clock displayed on a CRT oscilloscope configured in X-Y mode as a vector monitor with dual R2R DACs to generate the analog voltages. Most modern oscilloscopes have several inputs for voltages, and thus can be used to plot one varying voltage versus another. This is especially useful for graphing I-V curves (current versus voltage characteristics) for components such as diodes, as well Lissajous patterns. Lissajous figures are an example of how an oscilloscope can be used to track phase differences between multiple input signals. This is very frequently used in broadcast engineering to plot the left and right stereophonic channels, to ensure that the stereo generator is calibrated properly. Historically, stable Lissajous figures were used to show that two sine waves had a relatively simple frequency relationship, a numerically-small ratio. They also indicated phase difference between two sine waves of the same frequency. The X-Y mode also lets the oscilloscope serve as a vector monitor to display images or user interfaces. Many early games, such as Tennis for Two, used an oscilloscope as an output device. Complete loss of signal in an X-Y CRT display means that the beam is stationary, striking a small spot. This risks burning the phosphor if the brightness is too high. Such damage was more common in older scopes as the phosphors previously used burned more easily. Some dedicated X-Y displays reduce beam current greatly, or blank the display entirely, if there are no inputs present. As with all practical instruments, oscilloscopes do not respond equally to all possible input frequencies. The range of frequencies an oscilloscope can usefully display is referred to as its bandwidth. Bandwidth applies primarily to the Y-axis, though the X-axis sweeps must be fast enough to show the highest-frequency waveforms. The bandwidth is defined as the frequency at which the sensitivity is 0.707 of the sensitivity at DC or the lowest AC frequency (a drop of 3 dB). The oscilloscope's response drops off rapidly as the input frequency rises above that point. Within the stated bandwidth the response is not necessarily exactly uniform (or "flat"), but should always fall within a +0 to -3 dB range. One source says there is a noticeable effect on the accuracy of voltage measurements at only 20 percent of the stated bandwidth. Some oscilloscopes' specifications do include a narrower tolerance range within the stated bandwidth. Probes also have bandwidth limits and must be chosen and used to properly handle the frequencies of interest. To achieve the flattest response, most probes must be "compensated" (an adjustment performed using a test signal from the oscilloscope) to allow for the reactance of the probe's cable. For example, an oscilloscope intended to resolve pulses with a rise time of 1 nanosecond would have a bandwidth of 350 MHz. In analog instruments, the bandwidth of the oscilloscope is limited by the vertical amplifiers and the CRT or other display subsystem. In digital instruments, the sampling rate of the analog to digital converter (ADC) is a factor, but the stated analog bandwidth (and therefore the overall bandwidth of the instrument) is usually less than the ADC's Nyquist frequency. This is due to limitations in the analog signal amplifier, deliberate design of the anti-aliasing filter that precedes the ADC, or both. For a digital oscilloscope, a rule of thumb is that the continuous sampling rate should be ten times the highest frequency desired to resolve; for example a 20 megasample/second rate would be applicable for measuring signals up to about 2 megahertz. This lets the anti-aliasing filter be designed with a 3 dB down point of 2 MHz and an effective cutoff at 10 MHz (the Nyquist frequency), avoiding the artifacts of a very steep ("brick-wall") filter. A sampling oscilloscope can display signals of considerably higher frequency than the sampling rate if the signals are exactly, or nearly, repetitive. It does this by taking one sample from each successive repetition of the input waveform, each sample being at an increased time interval from the trigger event. The waveform is then displayed from these collected samples. This mechanism is referred to as "equivalent-time sampling". Some oscilloscopes can operate in either this mode or in the more traditional "real-time" mode at the operator's choice. Some oscilloscopes have cursors. These are lines that can be moved about the screen to measure the time interval between two points, or the difference between two voltages. A few older oscilloscopes simply brightened the trace at movable locations. These cursors are more accurate than visual estimates referring to graticule lines. Better quality general purpose oscilloscopes include a calibration signal for setting up the compensation of test probes; this is (often) a 1 kHz square-wave signal of a definite peak-to-peak voltage available at a test terminal on the front panel. Some better oscilloscopes also have a squared-off loop for checking and adjusting current probes. Sometimes a user wants to see an event that happens only occasionally. To catch these events, some oscilloscopes—called storage scopes—preserve the most recent sweep on the screen. This was originally achieved with a special CRT, a "storage tube", which retained the image of even a very brief event for a long time. Some digital oscilloscopes can sweep at speeds as slow as once per hour, emulating a strip chart recorder. That is, the signal scrolls across the screen from right to left. Most oscilloscopes with this facility switch from a sweep to a strip-chart mode at about one sweep per ten seconds. This is because otherwise, the scope looks broken: it's collecting data, but the dot cannot be seen. All but the simplest models of current oscilloscopes more often use digital signal sampling. Samples feed fast analog-to-digital converters, following which all signal processing (and storage) is digital. Many oscilloscopes accommodate plug-in modules for different purposes, e.g., high-sensitivity amplifiers of relatively narrow bandwidth, differential amplifiers, amplifiers with four or more channels, sampling plugins for repetitive signals of very high frequency, and special-purpose plugins, including audio/ultrasonic spectrum analyzers, and stable-offset-voltage direct-coupled channels with relatively high gain. Lissajous figures on an oscilloscope, with 90 degrees phase difference between x and y inputs. One of the most frequent uses of scopes is troubleshooting malfunctioning electronic equipment. For example, where a voltmeter may show a totally unexpected voltage, a scope may reveal that the circuit is oscillating. In other cases the precise shape or timing of a pulse is important. In a piece of electronic equipment, for example, the connections between stages (e.g., electronic mixers, electronic oscillators, amplifiers) may be 'probed' for the expected signal, using the scope as a simple signal tracer. If the expected signal is absent or incorrect, some preceding stage of the electronics is not operating correctly. Since most failures occur because of a single faulty component, each measurement can show that some of the stages of a complex piece of equipment either work, or probably did not cause the fault. Once the faulty stage is found, further probing can usually tell a skilled technician exactly which component has failed. Once the component is replaced, the unit can be restored to service, or at least the next fault can be isolated. This sort of troubleshooting is typical of radio and TV receivers, as well as audio amplifiers, but can apply to quite-different devices such as electronic motor drives. Another use is to check newly designed circuitry. Often, a newly designed circuit misbehaves because of design errors, bad voltage levels, electrical noise etc. Digital electronics usually operate from a clock, so a dual-trace scope showing both the clock signal and a test signal dependent upon the clock is useful. Storage scopes are helpful for "capturing" rare electronic events that cause defective operation. Sum of a low-frequency and a high-frequency signal. Dual trace, showing different time bases on each trace. First appearing in the 1970s for ignition system analysis, automotive oscilloscopes are becoming an important workshop tool for testing sensors and output signals on electronic engine management systems, braking and stability systems. Some oscilloscopes can trigger and decode serial bus messages, such as the CAN bus commonly used in automotive applications. For work at high frequencies and with fast digital signals, the bandwidth of the vertical amplifiers and sampling rate must be high enough. For general-purpose use, a bandwidth of at least 100 MHz is usually satisfactory. A much lower bandwidth is sufficient for audio-frequency applications only. A useful sweep range is from one second to 100 nanoseconds, with appropriate triggering and (for analog instruments) sweep delay. A well-designed, stable trigger circuit is required for a steady display. The chief benefit of a quality oscilloscope is the quality of the trigger circuit. Key selection criteria of a DSO (apart from input bandwidth) are the sample memory depth and sample rate. Early DSOs in the mid- to late 1990s only had a few KB of sample memory per channel. This is adequate for basic waveform display, but does not allow detailed examination of the waveform or inspection of long data packets for example. Even entry-level (<$500) modern DSOs now have 1 MB or more of sample memory per channel, and this has become the expected minimum in any modern DSO. Often this sample memory is shared between channels, and can sometimes only be fully available at lower sample rates. At the highest sample rates, the memory may be limited to a few tens of KB. Any modern "real-time" sample rate DSO typically has 5–10 times the input bandwidth in sample rate. So a 100 MHz bandwidth DSO would have 500 Ms/s – 1 Gs/s sample rate. The theoretical minimum sample rate required, using SinX/x interpolation, is 2.5 times the bandwidth. Analog oscilloscopes have been almost totally displaced by digital storage scopes except for use exclusively at lower frequencies. Greatly increased sample rates have largely eliminated the display of incorrect signals, known as "aliasing", which was sometimes present in the first generation of digital scopes. The problem can still occur when, for example, viewing a short section of a repetitive waveform that repeats at intervals thousands of times longer than the section viewed (for example a short synchronization pulse at the beginning of a particular television line), with an oscilloscope that cannot store the extremely large number of samples between one instance of the short section and the next. The used test equipment market, particularly on-line auction venues, typically has a wide selection of older analog scopes available. However it is becoming more difficult to obtain replacement parts for these instruments, and repair services are generally unavailable from the original manufacturer. Used instruments are usually out of calibration, and recalibration by companies with the equipment and expertise usually costs more than the second-hand value of the instrument. As of 2007[update], a 350 MHz bandwidth (BW), 2.5 gigasamples per second (GS/s), dual-channel digital storage scope costs about US$7000 new. On the lowest end, an inexpensive hobby-grade single-channel DSO could be purchased for under $90 as of June 2011. These often have limited bandwidth and other facilities, but fulfill the basic functions of an oscilloscope. Many oscilloscopes today provide one or more external interfaces to allow remote instrument control by external software. These interfaces (or buses) include GPIB, Ethernet, serial port, and USB. The following section is a brief summary of various types and models available. For a detailed discussion, refer to the other article. Example of an analog oscilloscope Lissajous figure, showing a harmonic relationship of 1 horizontal oscillation cycle to 3 vertical oscillation cycles. For analog television, an analog oscilloscope can be used as a vectorscope to analyze complex signal properties, such as this display of SMPTE color bars. The earliest and simplest type of oscilloscope consisted of a cathode ray tube, a vertical amplifier, a timebase, a horizontal amplifier and a power supply. These are now called "analog" scopes to distinguish them from the "digital" scopes that became common in the 1990s and later. Analog scopes do not necessarily include a calibrated reference grid for size measurement of waves, and they may not display waves in the traditional sense of a line segment sweeping from left to right. Instead, they could be used for signal analysis by feeding a reference signal into one axis and the signal to measure into the other axis. For an oscillating reference and measurement signal, this results in a complex looping pattern referred to as a Lissajous curve. The shape of the curve can be interpreted to identify properties of the measurement signal in relation to the reference signal, and is useful across a wide range of oscillation frequencies. The dual-beam analog oscilloscope can display two signals simultaneously. A special dual-beam CRT generates and deflects two separate beams. Multi-trace analog oscilloscopes can simulate a dual-beam display with chop and alternate sweeps—but those features do not provide simultaneous displays. (Real time digital oscilloscopes offer the same benefits of a dual-beam oscilloscope, but they do not require a dual-beam display.) The disadvantages of the dual trace oscilloscope are that it cannot switch quickly between traces, and cannot capture two fast transient events. A dual beam oscilloscope avoids those problems. Trace storage is an extra feature available on some analog scopes; they used direct-view storage CRTs. Storage allows a trace pattern that normally would decay in a fraction of a second to remain on the screen for several minutes or longer. An electrical circuit can then be deliberately activated to store and erase the trace on the screen. While analog devices use continually varying voltages, digital devices use numbers that correspond to samples of the voltage. In the case of digital oscilloscopes, an analog-to-digital converter (ADC) changes the measured voltages into digital information. The digital storage oscilloscope, or DSO for short, is now the preferred type for most industrial applications, though hobbyists still use simple analog CROs. It replaces the electrostatic storage method in analog storage scopes with digital memory, which stores data as long as required without degradation and with uniform brightness. It also allows complex processing of the signal by high-speed digital signal processing circuits. A standard DSO is limited to capturing signals with a bandwidth of less than half the sampling rate of the ADC (called the Nyquist limit). There is a variation of the DSO called the digital sampling oscilloscope which can exceed this limit for certain types of signal, such as high-speed communications signals, where the waveform consists of repeating pulses. This type of DSO deliberately samples at a much lower frequency than the Nyquist limit and then uses signal processing to reconstruct a composite view of a typical pulse. A similar technique, with analog rather than digital samples, was used before the digital era in analog sampling oscilloscopes. A digital phosphor oscilloscope (DPO) uses color information to convey information about a signal. It may, for example, display infrequent signal data in blue to make it stand out. In a conventional analog scope, such a rare trace may not be visible. A mixed-signal oscilloscope (or MSO) has two kinds of inputs, a small number of analog channels (typically two or four), and a larger number of digital channels(typically sixteen). It provides the ability to accurately time-correlate analog and digital channels, thus offering a distinct advantage over a separate oscilloscope and logic analyser. Typically, digital channels may be grouped and displayed as a bus with each bus value displayed at the bottom of the display in hex or binary. On most MSOs, the trigger can be set across both analog and digital channels. A mixed-domain oscilloscope (MDO) will have an additional RF input port that goes into a spectrum analyzer part. [dubious – discuss] It links those traditionally separate instruments, enabling time-correlation of events in the time domain (like a specific serial data package) with events happening in the frequency domain (like RF transmissions). Handheld oscilloscopes are useful for many test and field service applications. Today, a hand held oscilloscope is usually a digital sampling oscilloscope, using a liquid crystal display. Some models of oscilloscope have isolated inputs, where the signal reference level terminals are not connected together. Each input channel can be used to make a "floating" measurement with an independent signal reference level. Measurements can be made without tying one side of the oscilloscope input to the circuit signal common or ground reference. A new type of oscilloscope is emerging that consists of a specialized signal acquisition board (which can be an external USB or parallel port device, or an internal add-on PCI or ISA card). The user interface and signal processing software runs on the user's computer, rather than on an embedded computer as in the case of a conventional DSO. A large number of instruments used in a variety of technical fields are really oscilloscopes with inputs, calibration, controls, display calibration, etc., specialized and optimized for a particular application. Examples of such oscilloscope-based instruments include waveform monitors for analyzing video levels in television productions and medical devices such as vital function monitors and electrocardiogram and electroencephalogram instruments. In automobile repair, an ignition analyzer is used to show the spark waveforms for each cylinder. All of these are essentially oscilloscopes, performing the basic task of showing the changes in one or more input signals over time in an X‑Y display. Other instruments convert the results of their measurements to a repetitive electrical signal, and incorporate an oscilloscope as a display element. Such complex measurement systems include spectrum analyzers, transistor analyzers, and time domain reflectometers (TDRs). Unlike an oscilloscope, these instruments automatically generate stimulus or sweep a measurement parameter. The Braun tube was known in 1897, and in 1899 Jonathan Zenneck equipped it with beam-forming plates and a magnetic field for sweeping the trace. 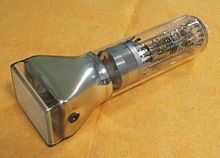 Early cathode ray tubes had been applied experimentally to laboratory measurements as early as the 1920s, but suffered from poor stability of the vacuum and the cathode emitters. V. K. Zworykin described a permanently sealed, high-vacuum cathode ray tube with a thermionic emitter in 1931. This stable and reproducible component allowed General Radio to manufacture an oscilloscope that was usable outside a laboratory setting. After World War II surplus electronic parts became the basis of revival of Heathkit Corporation, and a $50 oscilloscope kit made from such parts was a first market success. ^ "Cathode-Ray Oscillograph 274A Equipment DuMont Labs, Allen B" (in German). Radiomuseum.org. Archived from the original on 2014-02-03. Retrieved 2014-03-15. ^ Probes are designed for a specific input impedance. They have compensation adjustments with a limited range, so they often cannot be used on different input impedances. ^ Tektronix (1983, p. 426); Tek claims 300 MHz resistive coax at 30 pF per meter; schematic has 5 adjustments. ^ Jones, David. "Oscilloscope Trigger Holdoff Tutorial". EEVblog. Archived from the original on 28 January 2013. Retrieved 30 December 2012. ^ Nosowitz, Dan (2008-11-08). "'Tennis for Two', the World's First Graphical Videogame". Retromodo. Gizmodo. Archived from the original on 2008-12-07. Retrieved 2008-11-09. ^ a b Webster, John G. (1999). The Measurement, Instrumentation and Sensors Handbook (illustrated ed.). Springer. p. 37-24. ISBN 978-3540648307. ^ Jones, David. "DSO Tutorial". EEVblog. Archived from the original on 28 January 2013. Retrieved 30 December 2012. ^ "Minimum Required Sample Rate for a 1-GHz Bandwidth Oscilloscope" (PDF). keysight.com. Keysight Technologies. Archived (PDF) from the original on 16 June 2013. Retrieved 30 December 2012. ^ Sampling Oscilloscope Techniques (PDF), Tektronix, 1989, Technique Primer 47W-7209, archived (PDF) from the original on 3 March 2016, retrieved 11 October 2012, In 1960 Tektronix made it possible to measure signals over 100 MHz with the introduction of the first analog sampling oscilloscope. 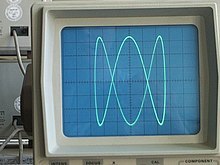 Wikimedia Commons has media related to Oscilloscopes.